Book Store Event Saturday, June 2nd! 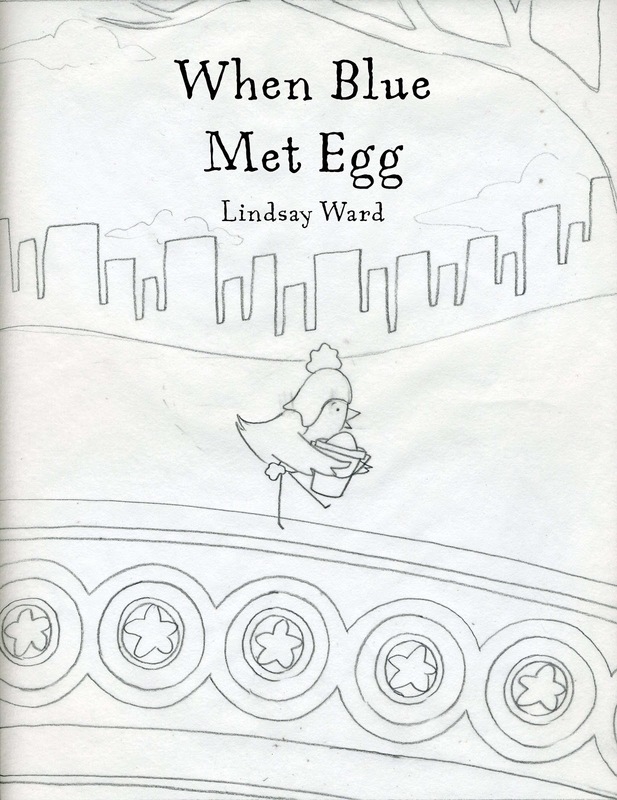 This week has been a bit crazy, so unfortunately I missed posting anything yesterday, but I did want to mention that if you are going to be in Columbus, Ohio this Saturday Blue, Egg, and I will be at Cover to Cover Books. We will be there at 11am for story time! We hope to see you there!! Saturday, June 2, 2012 at 11 a.m. 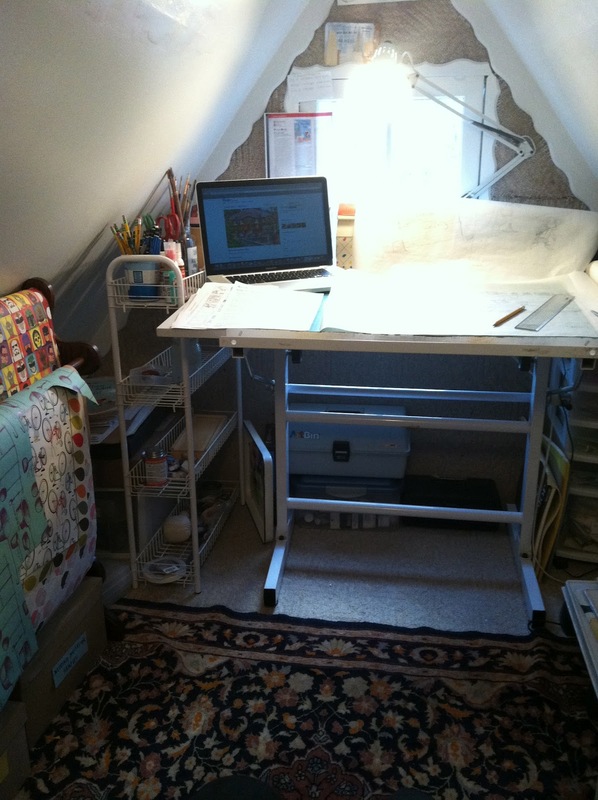 So I realize I’m a bit late on the whole Pinterest train, but now that I’m completely obsessed with it, I though I would share why I think it is so amazing, especially for illustrators. For those of you who don’t know, Pinterest is this fabulous website (www.pinterest.com) where you can group collections of photos, either your own or ones you find online. Each collection is created on what is called a ‘board’. You give each of your boards a title and short description. They can be about anything you want and Pinterest will ask you to designate them to a category, like Home Decor, Art, Books, etc. You can follow other people and see what they are pinning as well. Photos can be ‘repined’ or ‘liked’ (as on Twitter and Facebook). If you are familiar with the Etsy treasury lists, this the same idea but on a much broader scale because you aren’t limited to items listed only on Etsy. I started realizing how clever Pinterest was when I began having brides (I have a side business doing wedding invitations) who would send me their wedding idea boards so that I could get a feel for the look they wanted for their wedding. Which is completely brilliant! As a designer this made my job a million times easier. There are so many people who can’t verbalize what they want visually. Pinterest makes it so they don’t have too. They can just show me. I decided it was time to create my own account. Since Pinterest is becoming so popular, lots of online websites have figured out that it is in their best interest to include a Pinterest button for every item they list. 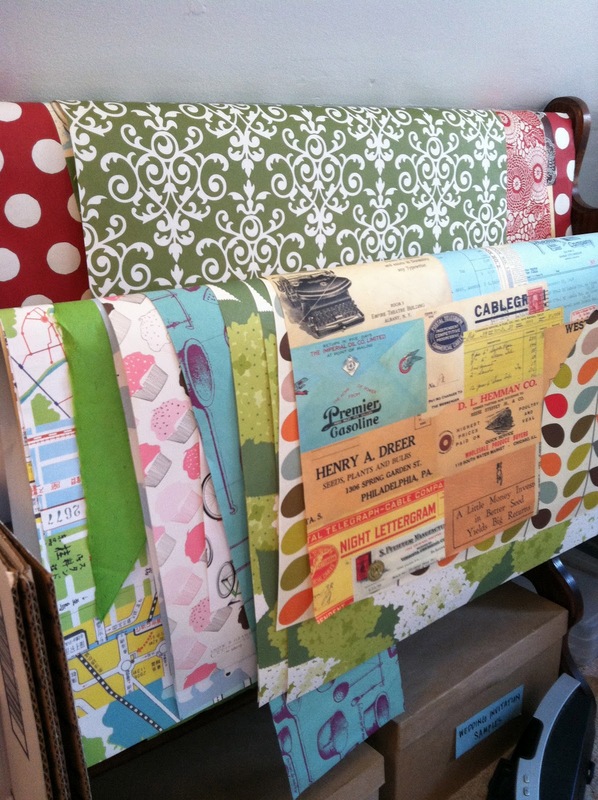 For example, say you find some paper you love on the Paper-Source.com, but you don’t necessarily need to buy it right now or you just want it for visual inspiration, you can pin it just by pressing a button. It’s so easy! For those of you who already know how great Pinterest is, sorry for the redundancy of this post. But if you were like me and didn’t know…I hope to see some of your fabulous boards soon. Why Do Picture Books Matter? With the death of Maurice Sendak last week, this question has been floating around in my mind a lot lately. I feel like there is a hole in the world now that he is gone. 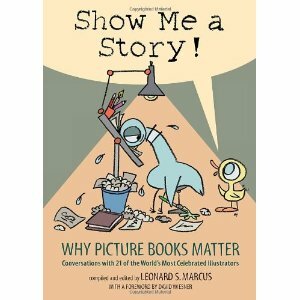 Originally, I had ordered a copy of Show Me A Story: Why Picture Books Matter by Leonard Marcus, from my local bookstore before the announcement of Sendak’s death, because it featured conversations with so many illustrators that I admire. 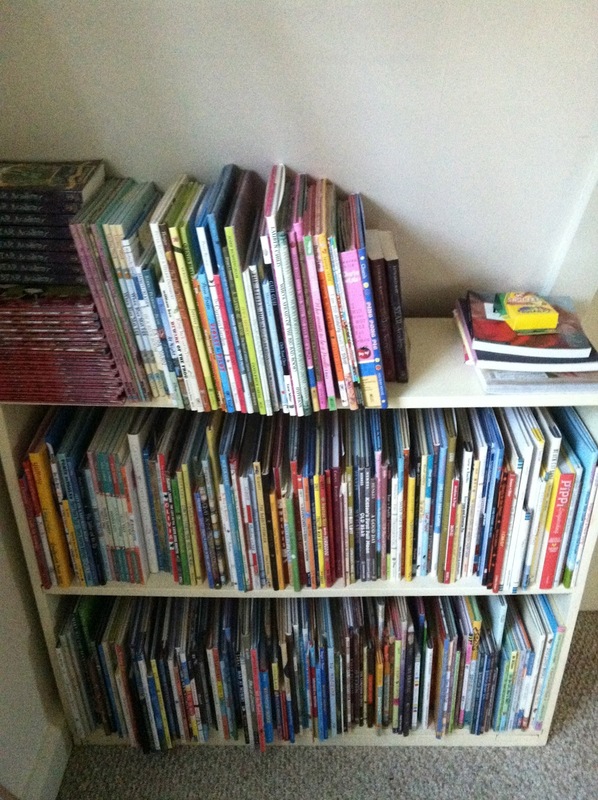 Burningham, Oxenbury, Blake, Marshall, Sis, Zwerger, and of course Sendak just to name a few. There are 21 total included in the book. But then I started reading because I needed answers. I needed to hear in their words why what we do is so important to young children. Why is it necessary? 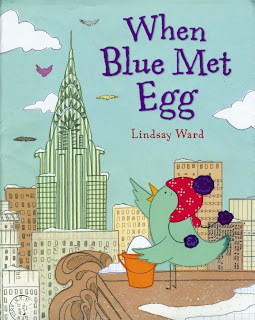 In an age of digital takeover, the idea of the loss of a picture book in the traditional format as we know it, is almost unbearable to think of. It breaks my heart to be honest. 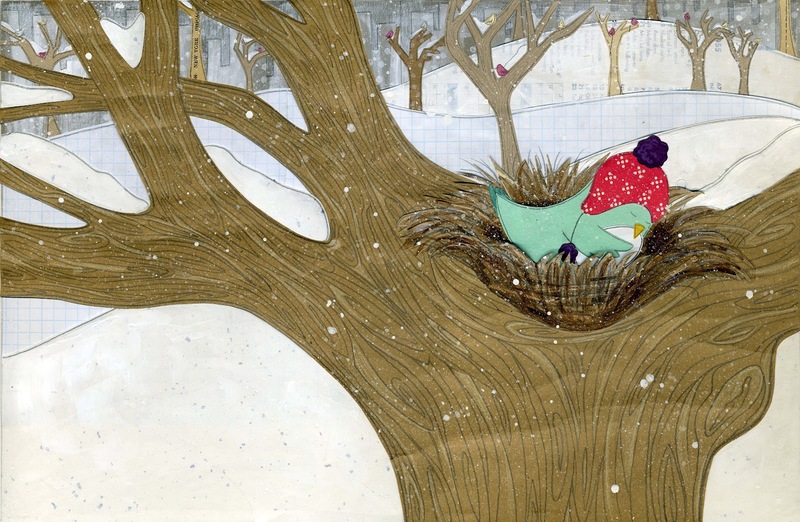 The picture book itself is an art form unlike any other type of illustration. Creating a narrative that marries text and images together harmoniously is incredibly difficult to do successfully. 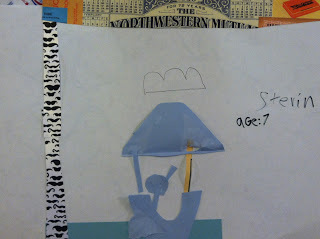 Show Me a Story includes so many writers and illustrators who had paved the way for picture books as a true art form. 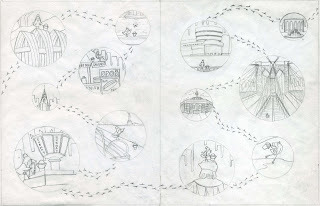 I think most of us as illustrators in this field hope that we can one day accomplish something close to what they did. I know I do. When I found out Sendak died, I cried. He meant so much to so many of us, as readers, illustrators, and human beings. I remember the first time I read the Little Bear books, they were so magical. I wanted a bear of my own to be friends with. Which is funny because I’m currently working on a book with a bear as one of the characters. So in a way I have found my bear. I feel like everyone has the Sendak story that they loved and read over and over again and the one that scared the pants off them. For me, In The Night Kitchen is my absolute favorite. I remember that was the first time I became obsessed with typography. I loved the all the design elements in the book. It was and still is one of the most beautiful books in my opinion. 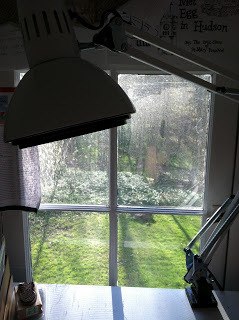 Now as much as I loved Sendak, Outside Over There, scared the crap out of me as a kid. I thought the babies and goblins were so creepy looking, staring out at the reader with these big eyes. Totally freaked me out. 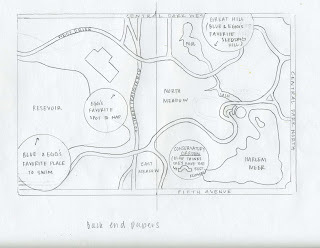 Which I found interesting, when I came to read Show Me A Story and Sendak revealed in his interview to Marcus that Outside Over There was inspired by the Lindbergh kidnapping that happened when Sendak was a child. Sendak said that his book was a way to deal with the outcome of the kidnapping, which as we know did not end well. And for a child that was incredibly frightening. This way he could stage a kidnapping with a happy ending. The way he wished history would have gone. 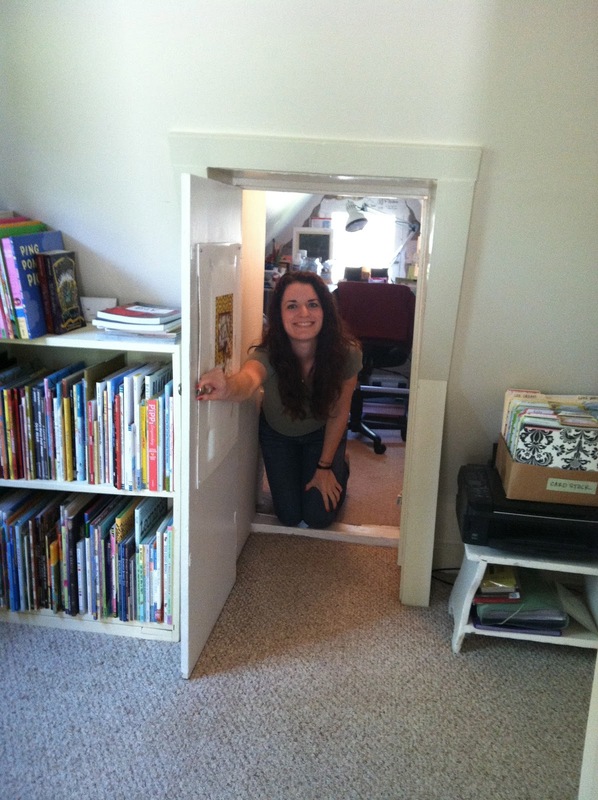 It is also said to be Sendak’s favorite book. This is what kids need. They need us to be real with them. To treat them like people. To show them that the possibilities are endless. Things may get difficult, but everyday is a new opportunity. That they can shoot for the moon, and maybe even hit it. While reading all of these wonderful interviews, I began to realize that each illustrator brought something different to the table. I found it fascinating that most of them didn’t set out to be picture book illustrators, but rather fell in to it by chance. Some started out in set design, advertising, editorial illustration, teachers, and other various jobs that incorporated art in some way or another. I was completely the opposite of this, going to school specifically for illustration, which for most of these illustrators wasn’t even an option available in art schools at the time. 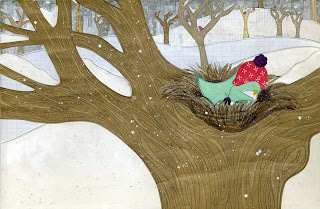 Now a days a lot of illustrators I meet that are around my age, have specifically studied picture book illustration. As more art schools began to develop their illustration programs, the graduating body became larger. Now picture book illustration is something people go and study. It’s amazing how times have changed. But without Sendak, Marshall, Steig, and many many others, we wouldn’t have anything to study in those programs. 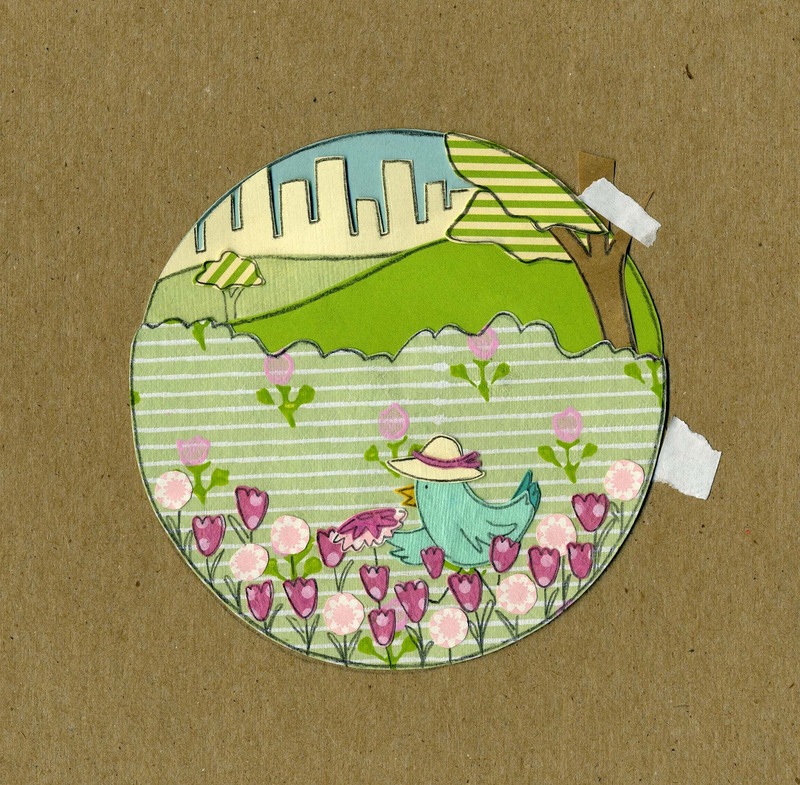 They paved the way for picture book illustration programs. And for that I will always be grateful to them. It’s up to us to show the dreams. 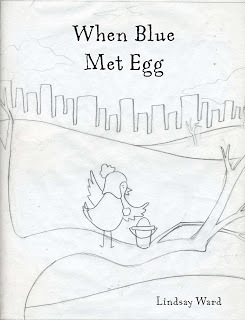 What inspired you to write When Blue Met Egg? Between my junior and senior year of college I moved to New York City for the summer working as an intern at an art gallery. Although I grew up in the Bay Area, I had never been to a city that felt as big as New York. I was so small compared to all the skyscrapers that surrounded me. 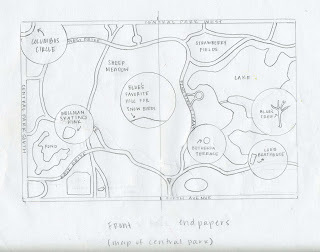 I lived on the Upper Westside so I spent a lot of time near Central Park. 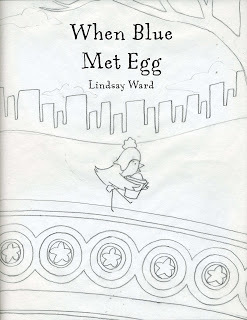 I think the combination of the setting and the way I felt that summer led me to write When Blue Met Egg. I loved the idea of a small character navigating a large city confidently. By the time I left New York I was so proud of the fact that I knew my way around and wasn’t afraid to explore new places. That is how I wanted Blue to be – brave, confident, and always willing to make new friends. 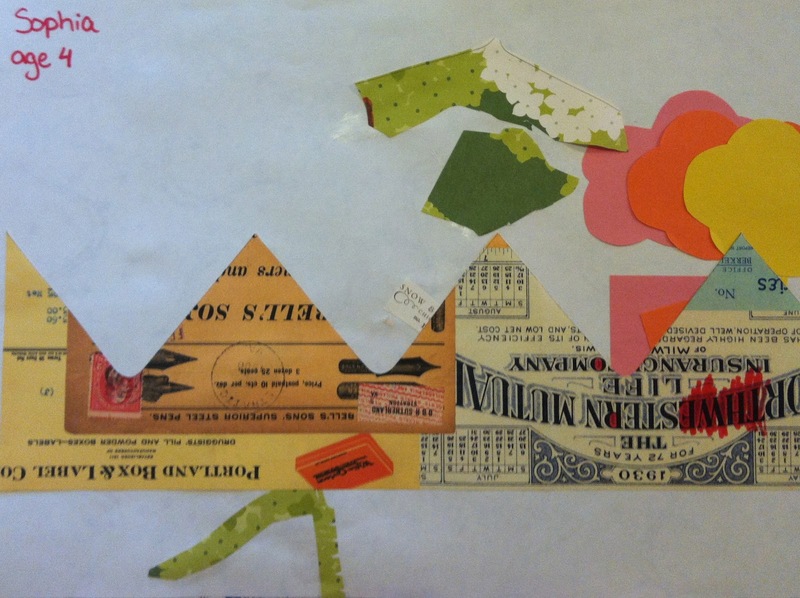 Since you work primarily in collage, can you tell us a little bit about your process? 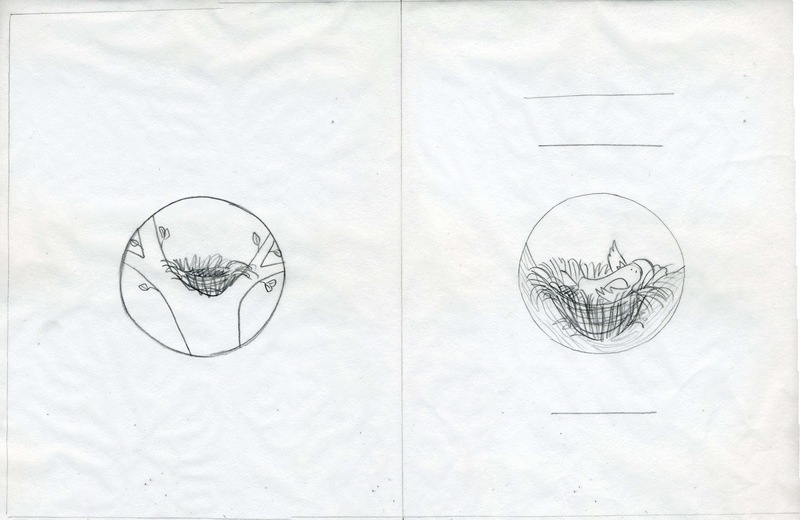 Do you sketch first, and when do you glue down your paper? 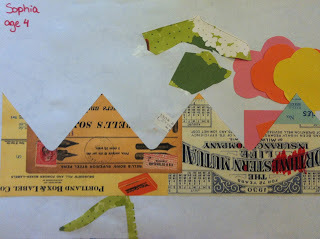 I work in cut paper and mixed media. Every shape is cut out of a different piece of paper and then glued down to a two-dimensional surface. 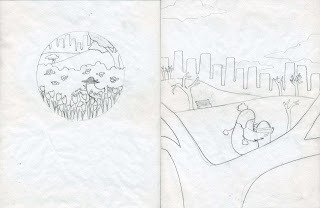 I begin by doing a lot of sketching. 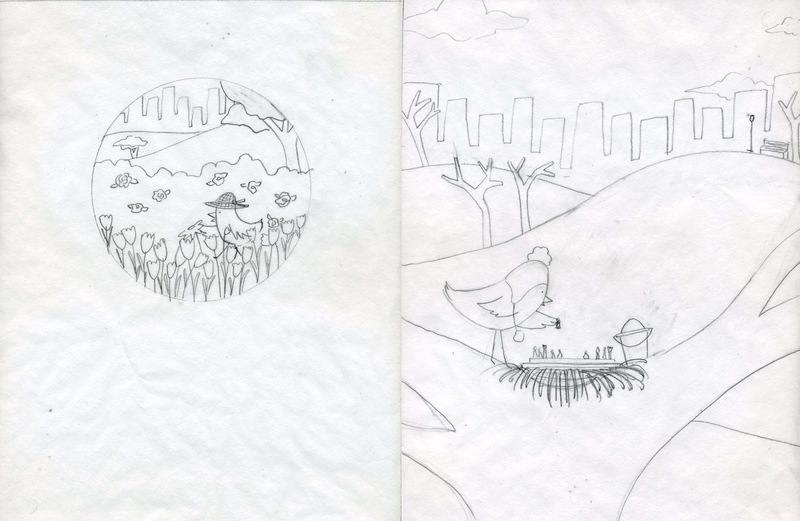 After I have an idea of what I want the composition to look like I transfer the sketches onto tracing paper. This is what I draw the final sketches on before going to the finished artwork. 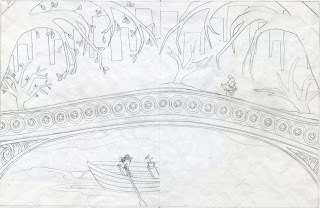 Once the sketches have been approved, I begin the process of transferring the drawings to illustration board. I individually transfer each shape in the drawing to the corresponding paper I have chosen to be used in the final artwork. Then begins the cutting…lots and lots of cutting. Thankfully I have my trusty blue scissors, which have been with me for every book I have worked on (I’m just a wee bit superstitious about them). I arrange each shape until I’m happy with its position, taping them down to the board, so I can move them around if need be. After approval, I glue everything down. Then…TA DA! It’s a book! Well almost. But you get the idea. 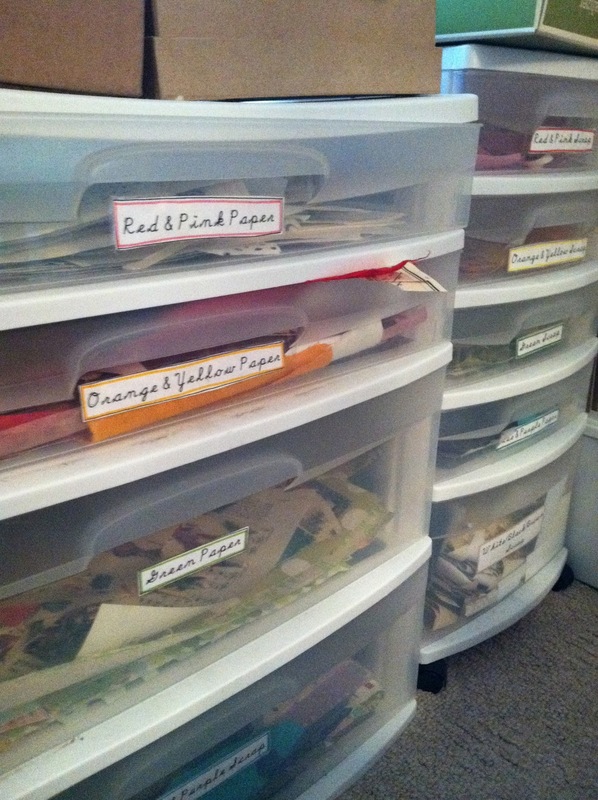 You must have a pretty amazing paper collection! 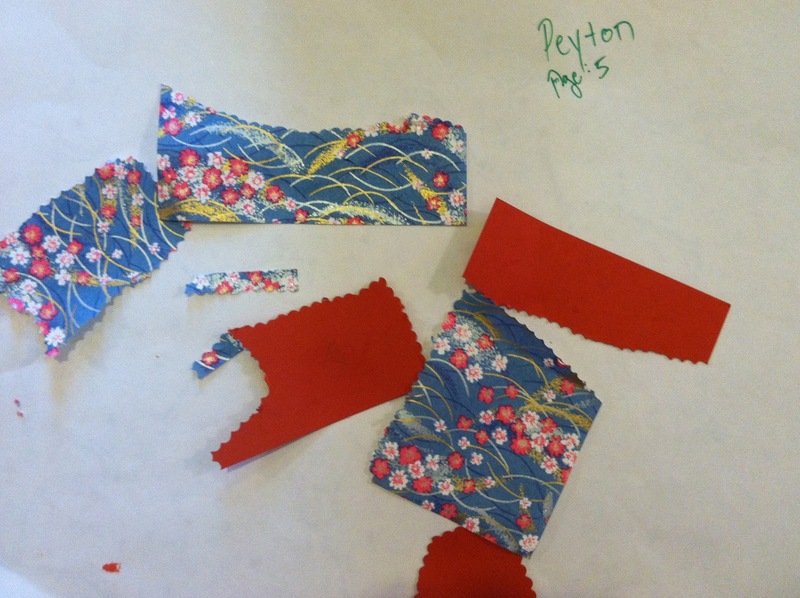 What kinds of paper did you use in the book, and where did you find it? I spend a lot of my time collecting paper, looking for just the right scraps. 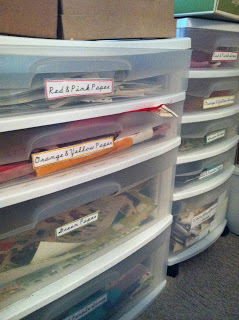 I have a bunch of color-coded bins in my studio that I use to organize all my paper. Most of the paper I use is vintage or antique, some of which is as old as the 1800s. 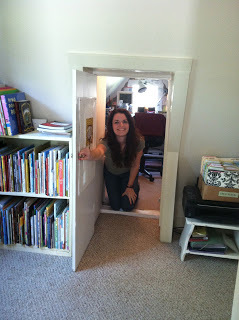 I go to garage and estate sales, paper boutiques, library sales, and used bookstores to find materials. All the paper I use relates to the story or theme in the book in some way or another. 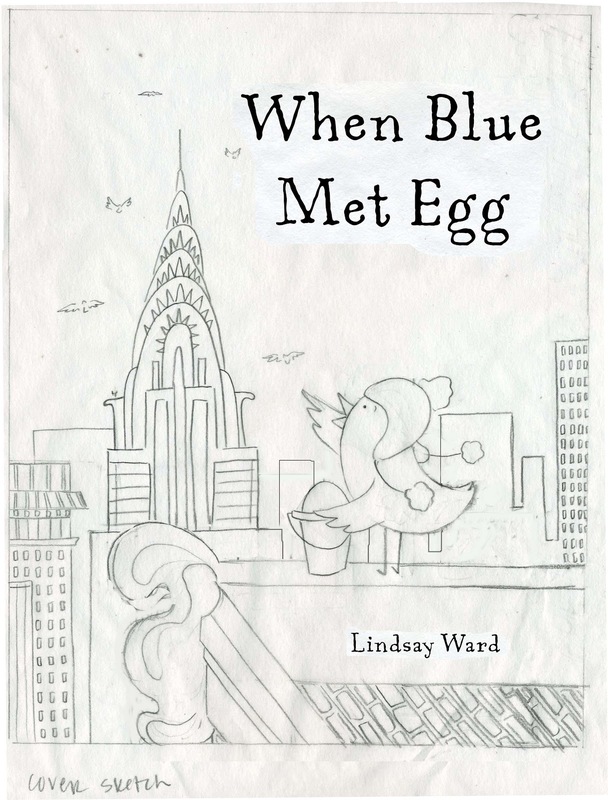 In When Blue Met Egg, I used old school test sheets from the 1950s, crossword puzzles, maps of New York from the 1930s, and vintage graph paper. 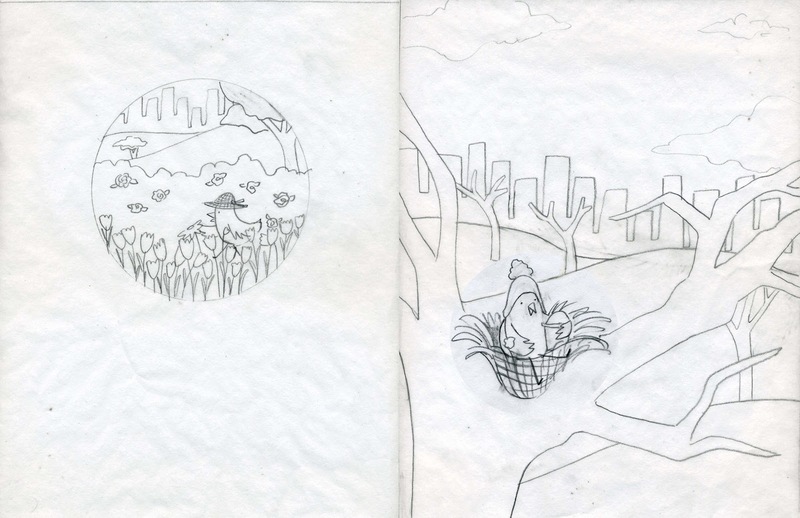 I gradually add what I find as I see fit while I’m working on each illustration. I love that at first glance readers see just my illustrations. 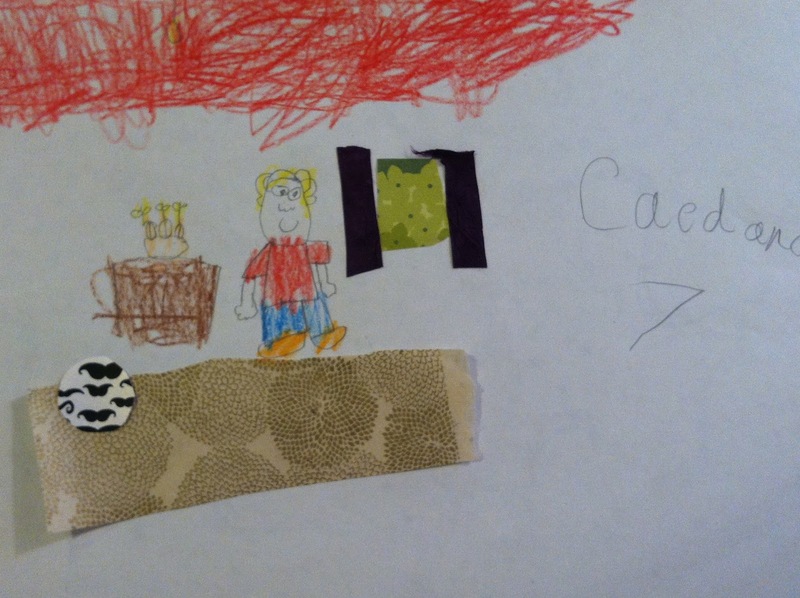 But upon closer inspection they find treasures, hidden in the papers I use. Beneath the paint and pencil marks exists links from the past, brought back to life and recycled in a new way. For me, that’s what the paper is when I find it, tiny hidden treasures left behind looking to be found. 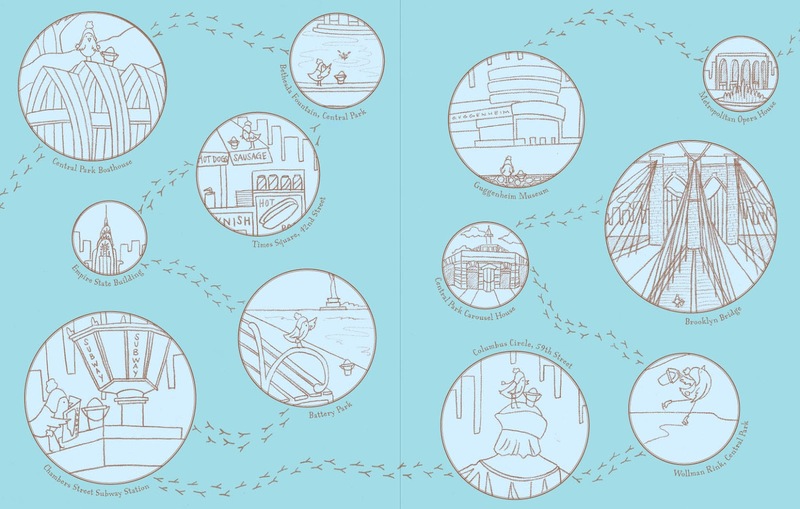 You have some incredibly detailed pieces in your book, especially the spread of the carousel in Central Park and the gatefold of the Brooklyn Bridge. 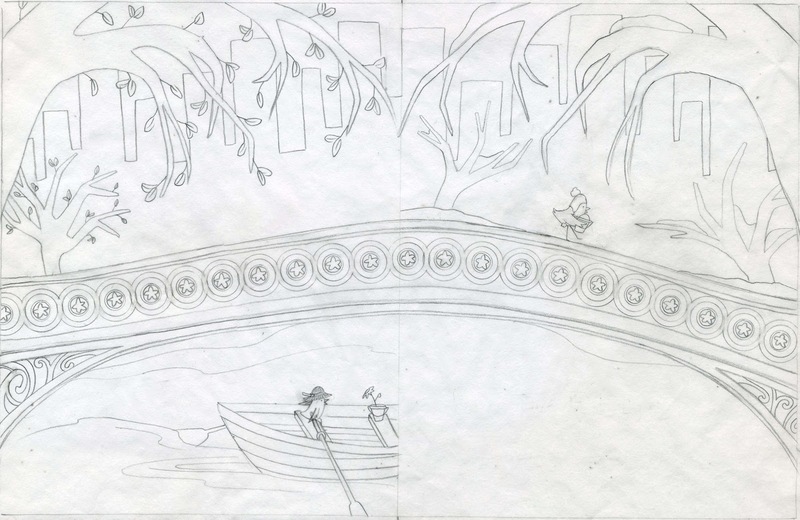 Which spread was the most challenging for you to complete, and how long did it take you to make? Both the carousel and the Brooklyn Bride were equally challenging, but for very different reasons. 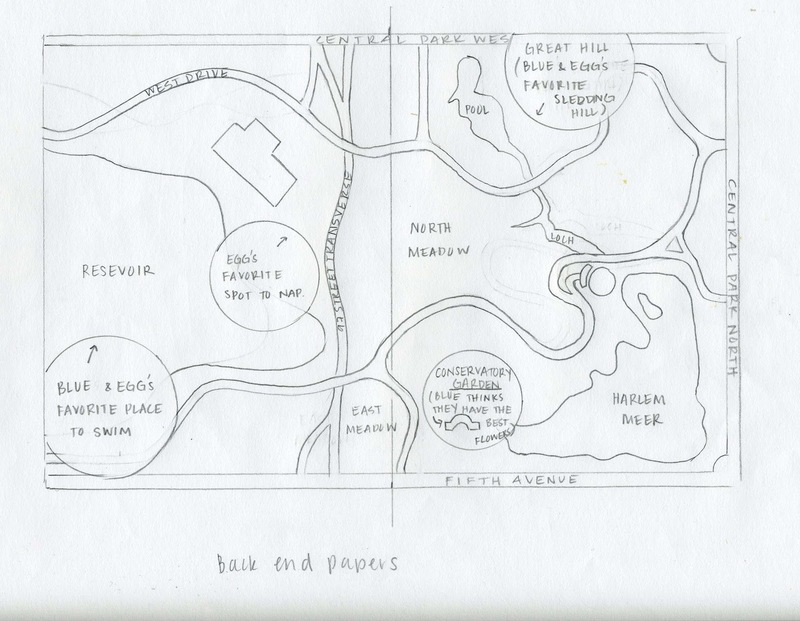 Originally the carousel in Central Park wasn’t in the book. 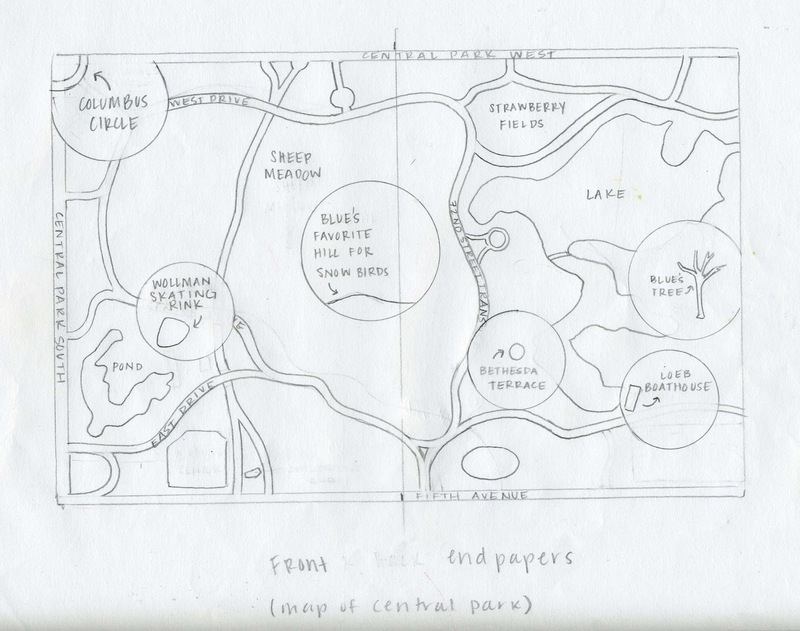 During sketch revisions, my editor suggested using a location in Central Park instead of the Natural History Museum (the original setting for that spread) for pacing reasons. Now let me preface this by saying that every artist has their thing that is just impossible to draw so they avoid it at all costs. Mine was horses. 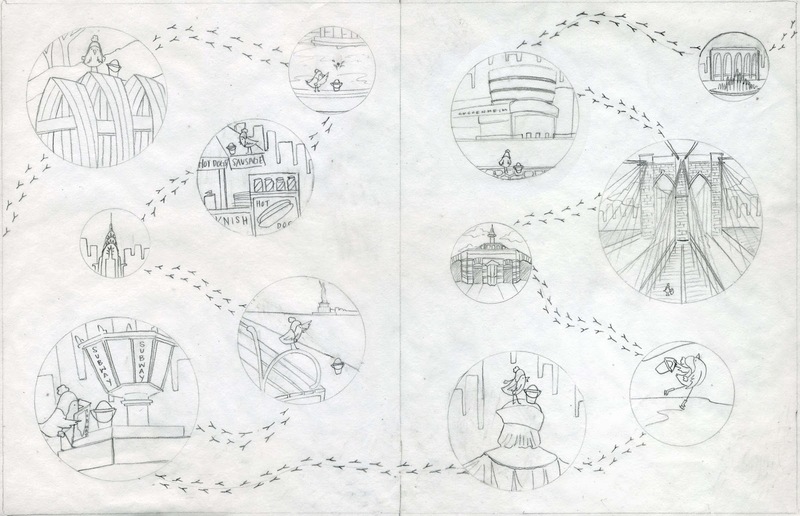 So you can imagine my reaction when my editor asked me to draw a whole carousel full of them. But after lots of sketching, I realized she was right and it made the book better. I couldn’t be happier with the way that spread turned out. Also, after drawing horses repeatedly for this spread, I’m proud to say I’m no longer intimidated by drawing the anatomy of a horse. As for the Brooklyn Bridge, I have no one to blame for the difficulty of that spread, except for myself. I was the one who though it would be brilliant to cut out a bridge with lots of cables. I fell in love with the idea of this spread before I thought about it logistically. It is to date the most masochistic piece I have ever taken on. Lets just say I had some very sore fingers covered in band-aids after the spread was completed. It is also by far my favorite spread in the book. 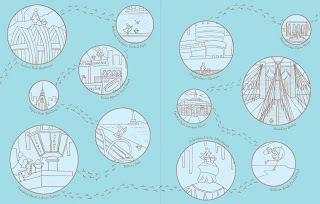 Each spread took me about three to four days to complete. 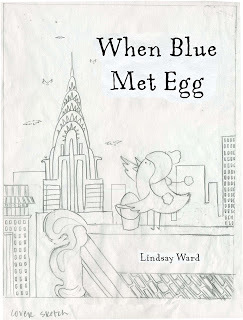 Have you been to all of the places Blue and Egg visit? Yes, with the exception of the boathouse, which I would love to have lunch at one day. However, there are things Blue does that I haven’t. 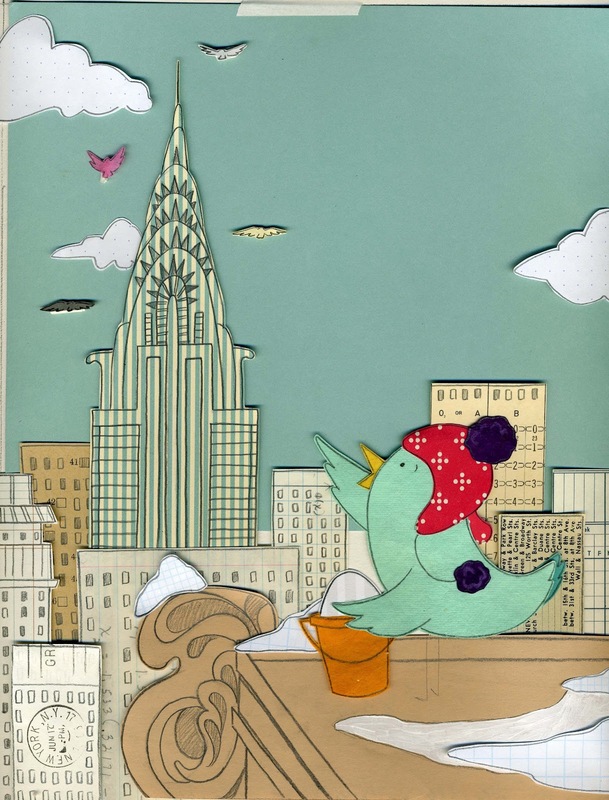 Here are few I’d like to try: make a snow bird in Central Park, watch snow fall on the Brooklyn Bridge, and make a wish in the Bethesda Fountain. Since Egg is really a snowball, were you worried about how you’d end the story? How did you come up with such a great solution? 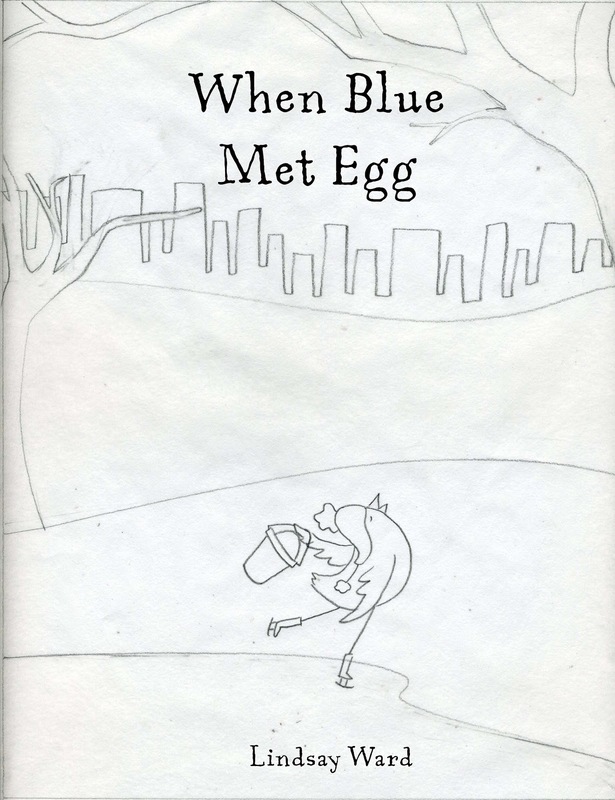 The ending of When Blue Met Egg came after writing many, many bad endings. When I was revising the manuscript I realized I had created this huge problem for myself by using a snowball as one of my characters. Obviously the snowball has to melt, which the reader knows from the start, anticipating a sad ending. I needed to think of a way that wasn’t sad, but uplifting and promising. 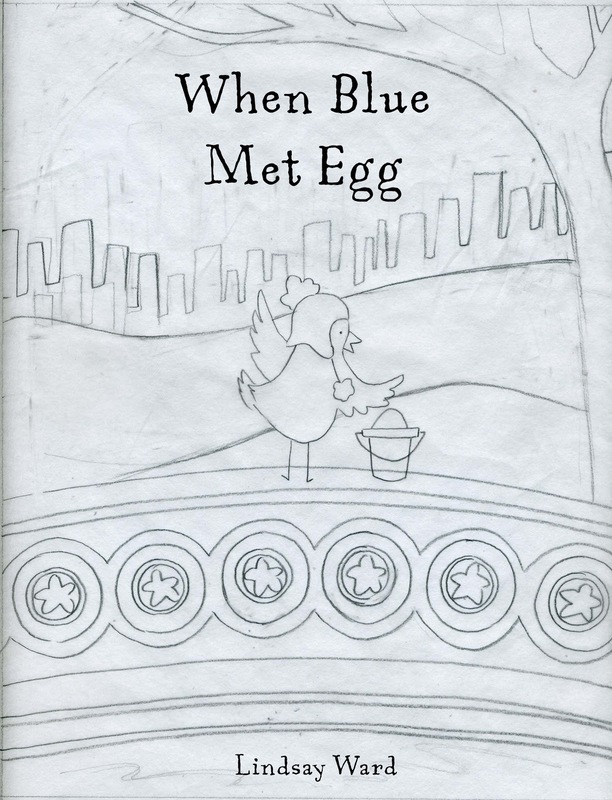 One thing I remember when I was working on Blue, was sitting on my couch one night thinking about how friends change, grow up, sometimes apart, and that’s life. Accepting change is one of the hardest things we do as human beings. I was drawn to the idea of a character that automatically looked past that, accepting her friend no matter what. I love that about Blue. 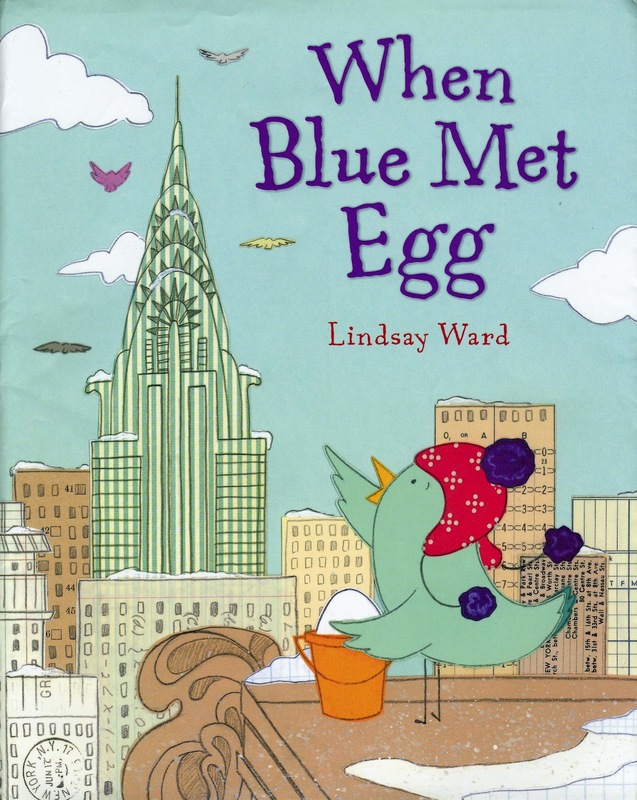 After the story ends, I picture Blue and Flower experiencing all the best things about springtime in New York. 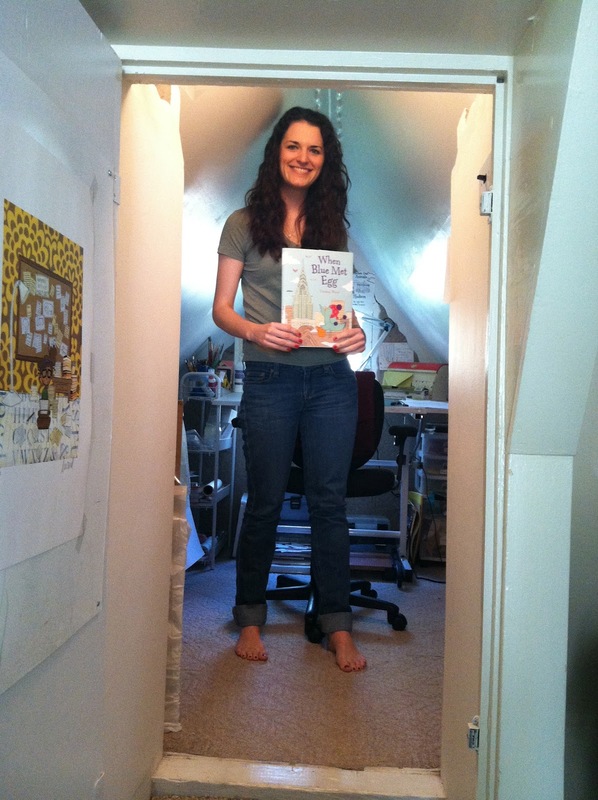 Did you always want to be a children’s book author/illustrator? Yes and no. Both my parents are artists so art was always around me growing up. But it wasn’t until I got my first job at Hicklebee’s Children’s Bookstore, that I figured out what type of art I wanted to do. 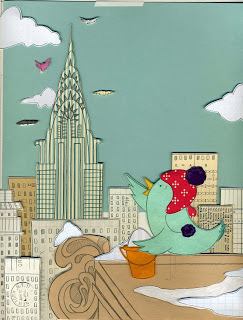 I fell madly in love with children’s book illustration. The idea of visual storytelling captivated me. I decided to apply to illustration programs for college, later graduating from Syracuse University. 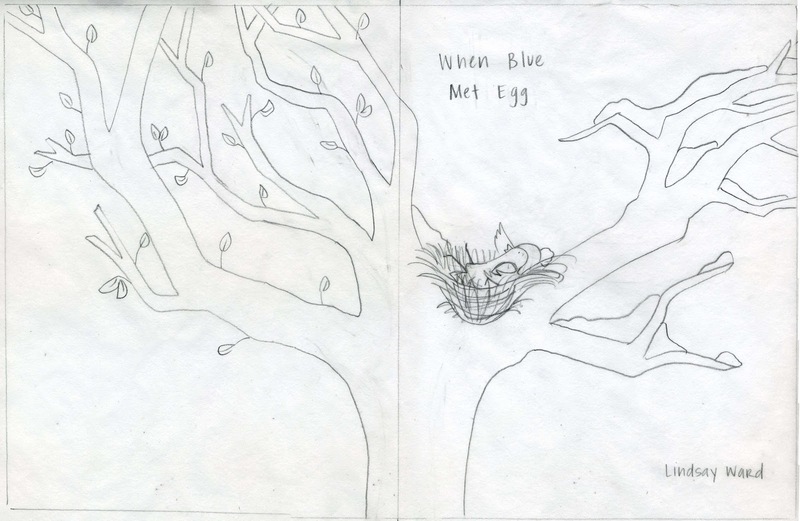 Illustrating children’s books has been my dream since I was fifteen. But writing, no way! I never thought I would write. Honestly, I never considered it. 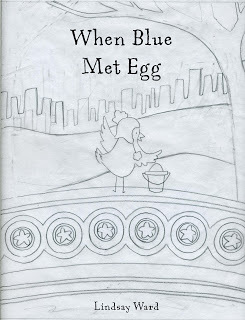 Even when I first came up with the idea of Blue, I never really thought about the story in terms of text. I just knew what I wanted it to look like visually. My agent was the first person to tell me she thought I was a writer too. I thought she was crazy. But she was right. 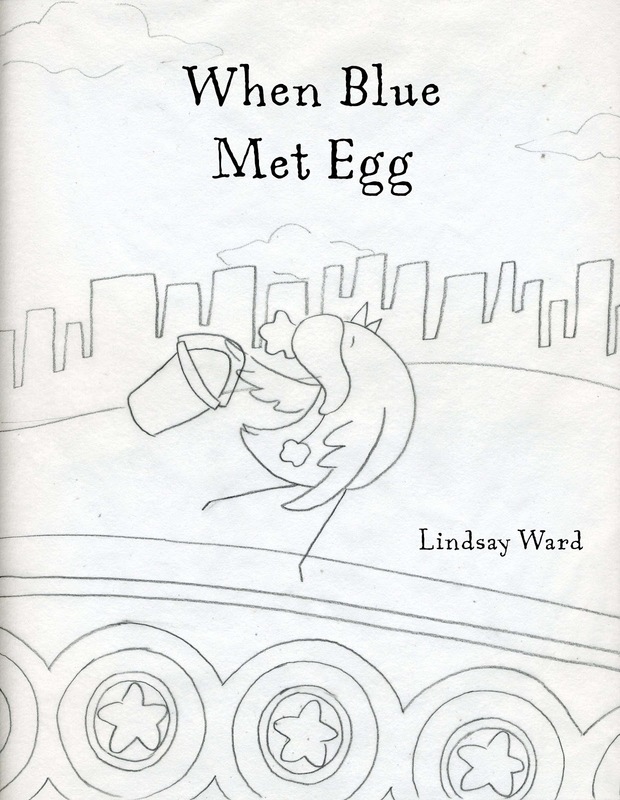 I’m now working on my third book as an author/illustrator. Can you tell us a little bit about your next book? This is a bit funny after what I said about the carousel spread, but it’s about a carousel that comes to life. No horses though. Its title is still up in the air at the moment. One day Emma finds a note attached to the saddle of her favorite animal on the Grand Carousel, the polar bear. Soon Emma finds that some things are not as they appear. And sometimes magic can happen when you least expect it. There will be lots of high flying adventure, magic, and maybe even a dancing polar bear or two. 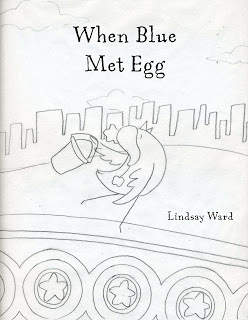 I’m very excited for the release of this book, which will be in 2013 by Dial Books for Young Readers. My design desk. I only do computer work here, usually designing illustration mailers or wedding invitations. My picture book collection, which I love dearly and is constantly growing. Some of the paper hanging in my studio. Sometimes I get really fabulous surprises in the mail, like this one, which end up on my walls. The view out my window. This is my backyard which drops off into a creek. It’s quite lovely. Told you I could. I’m not sure you believed me. Lots of paper bins. All color coded. 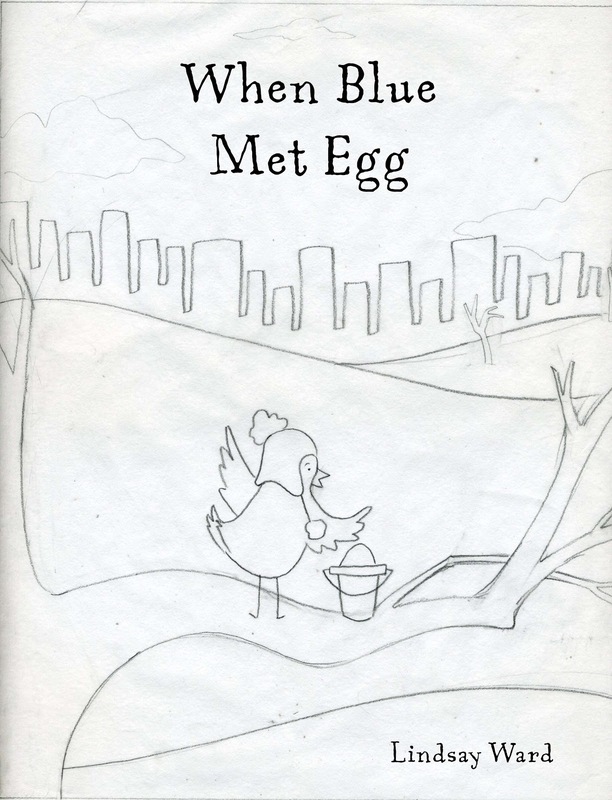 Want to know more about Blue?? Or have any illustration questions in general, type them as a comment below and I will make sure to post answers in next weeks blog post. Starting the Day With Cut Paper! 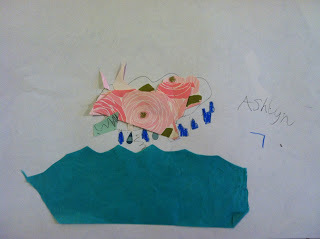 I spent the morning with some very artistic children in Akron, Ohio! We talked about making picture books and how to create illustrations using cut paper and mixed media. 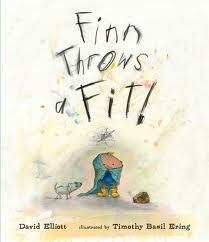 I read aloud Finn Throws a Fit, written by David Elliott and illustrated by Timothy Basil Ering, without showing them the book. This book is so much fun, filled with a lot of imagery that comes through in very few words. And the illustrations are fantastic! I think they came out pretty spectacular, don’t you?? COVER. 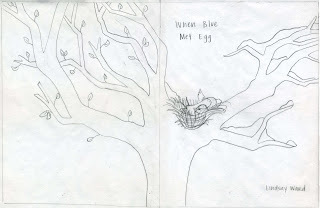 After blogging about how I created the interior of When Blue Met Egg, I thought I would post about the cover, endpapers, and jacket design, since I didn’t really get into that part of the process at all. 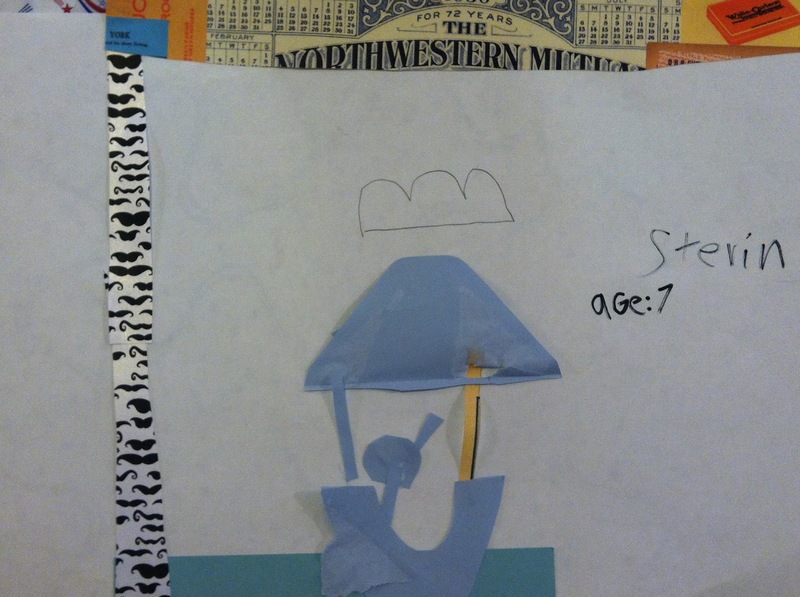 However, there are a lot of details to worry about when choosing the right image for the cover of a picture book. Obviously, the cover is very important. It grabs readers. It shouts “Hey look at me, take me home!” It is the identity of a book before readers have a chance to explore the pages. But there was nothing about this that told readers it was set in New York. This could be any other city for all they knew, based on the cover alone. 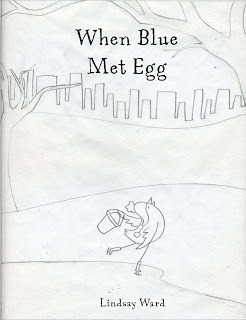 Normally, this wouldn’t matter, but New York City is the third character in When Blue Met Egg. I couldn’t just ignore the city altogether on the cover. Now, I would like to mention that I adore the lovely people at Dial that I worked with on Blue. So much so that we are currently working together on another book. But I’m sure you are thinking they are super picky at this point. I mean 40 or so drawings, really? Yes, really. But that is what makes them great at their job. They have to be picky. There is a lot of crap out there. They have to be able to get the best possible work out of their authors and illustrators or else what’s the point? At the end of the day they will present the cover to the marketing team, publisher, and general public. They will be the champions for your work. Yeah, your name is on it, but so is theirs. 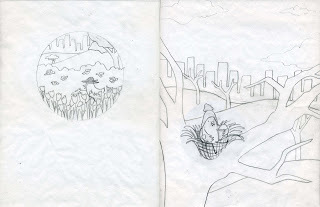 Each time my editor came back to me and asked me for more sketches, she sounded so apologetic about it. But I knew I hadn’t drawn the cover yet. I hadn’t given her my best work yet. I tried to look at it as if I was getting all the bad drawings out of the way, so I could create something truly extraordinary. I will be the first to admit, taking that mindset was not always easy. There were moments when I wanted to shout “Just pick one already!! !” But eventually it worked. 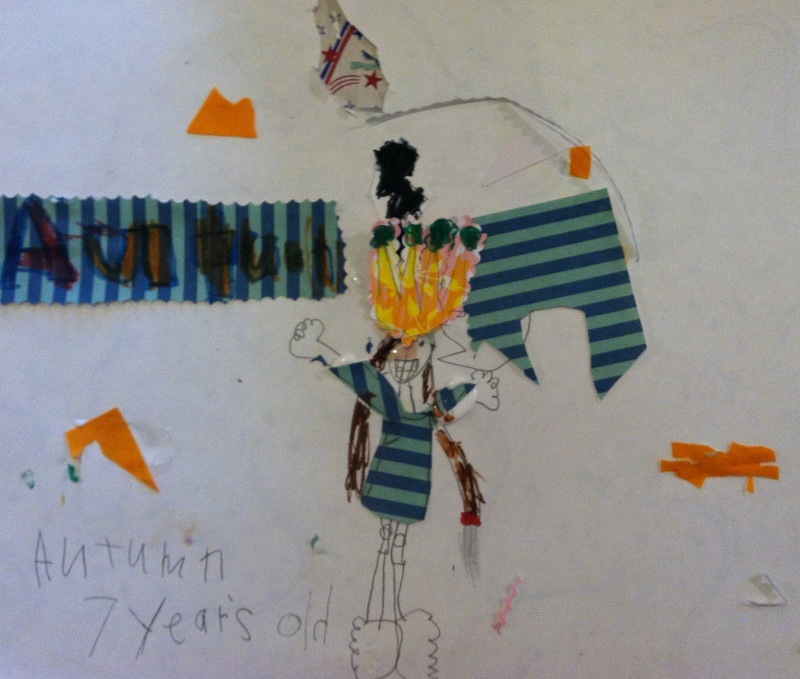 JACKET DESIGN. This is one of my favorite parts, even though I have nothing to do with it, other than sending in the cover artwork. FYI, in case you didn’t know, you don’t write your own jacket copy. Your editor does that for you. Which is very lovely of them because it is one less thing you have to worry about. 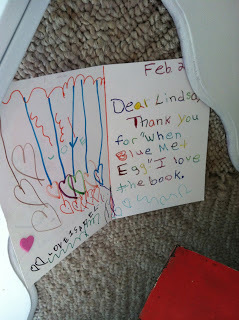 The book designer, Mina, added Blue holding up the barcode on the back. It’s my favorite part. 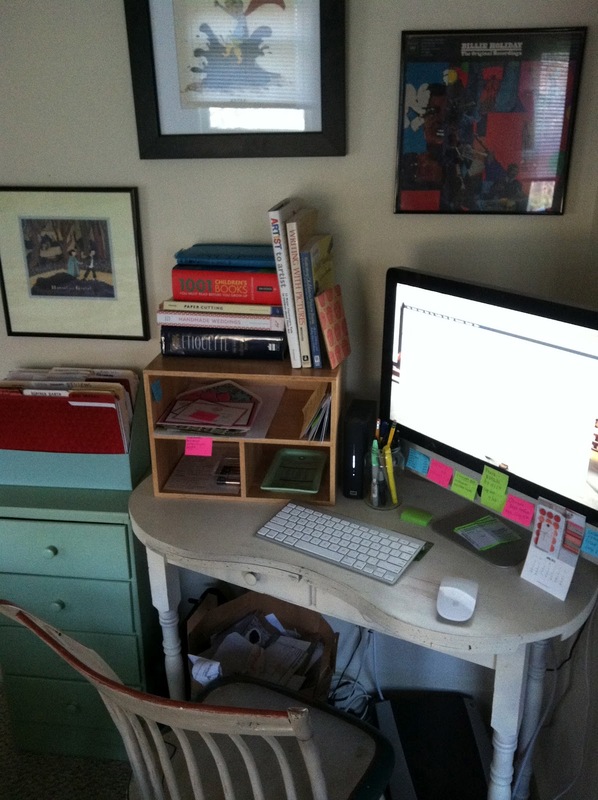 And that, lovely readers, is the (sometimes exhausting and stressful) process of making a cover, from start to finish.